James graduated from Mooers (N.Y.) Central High School in 1946. He was a Rutland Railroad Maintenance-of-Way employee, where he worked several summers and school vacations. He achieved 100 percent in a post-high school New York Board of Regents Mathematics Examination. As a U.S. Army volunteer, fall of 1946, James completed the 2000-hour Radar Electronics School, earning a Military Occupation Specialty rating of 955 in Airborne Radar. He became active in the newly formed U.S. Air Force, participating in the Berlin airlift, and the Winds Aloft evaluation for the B-36 flight inauguration. Honorably discharged in the fall of 1949. 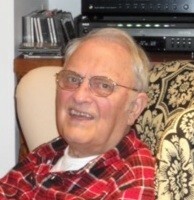 James was employed by the General Electric Company Armament Department, Burlington, in 1950 to work in the electrical test and evaluation of electro-mechanical products. His first assignment involved work on the Hermes Project, an adaptation of the WWII German sub-space artillery rockets, including component testing and evaluation. On October 17, 1953, James and Corinne Mae Parizo of Essex were married in Holy Family Church, Essex. Corinne predeceased him on January 19, 2001. Together with God, they conceived six progeny yielding five births. James transferred to the Quality Engineering Department in 1956 to work as quality representative on the department program teams for various weapons products, including the U.S. Army sub-space artillery rockets. He worked on Honest John, Nike Hercules, La Cross, and Little John until 1963. In 1962, he was assigned Quality Systems Specialist, representing reliability and quality control of Armament Department policy and procedure, and the maintenance of the Reliability and Quality Manual of Procedure and Instructions. Multi-barrel weapons products were assigned in 1968, including Fairchild-Republic and Helio Aircraft Corp., PAVE-COIN recon aircraft armament with 3-barrel 20mm mounted cannon and U.S. Marines AV-8B Harrier Jump Jet fighter 5-barrel 25mm rotary cannon. In 1972, James was assigned to the largest production line rapid-fire aircraft cannon built, the 30mm GAU- A7-barrel internal gun system used for the A-10 Tank Destroyer and the Naval Goalkeeper Turret Anti-missile Defense System. He was an active member of the American Society of Quality Control, serving on the Montréal section’s Burlington subsection staff. James served as a volunteer on Essex Town School District Committees, on the Holy Family Church Parish Council, and as a religious education instructor. He was a credit union supporter and volunteered for service on the credit (loan) committee and as a credit union director for 18 years. He served as secretary, treasurer, vice chair, and chair of the board of directors of the General Electric Employees Credit Union, later the North Country Federal Credit Union. Since credit union members are also owners of their credit unions, James was a strong advocate of member participation in the business of the financial institution, especially the annual meetings for election of the policy-making directors and disposition of other credit union business. At his first annual meeting as chair, he declared the thousands of members absent in dereliction of their obligations, leaving barely enough present to satisfy quorum requirements of the state charter needed to conduct credit union business. He never ceased to encourage member participation which did improve. James was also a strong advocate of expansion of early credit union services beyond basic lending, savings and financial counseling. He either introduced, or strongly supported, introduction of share draft (checking) service with overdraft protection, credit cards, ATM cards, call-24 phone access to member accounts, certificates of deposit, IRA accounts, money market, mortgage, and other financial services. When James ceased volunteer service as a director, the G.E. Employees Credit Union was a full-service financial institution. James is survived by his children, the primary reason for his being: James Edwin Baker III, builder/restorer, and spouse Debora; Julie Y. Baker Albright, fine artist/homemaker, and spouse David; Jennifer K. Baker Handy, CPA/homemaker, and spouse John; and Justin Jefferson Baker, priest of the Catholic Church. He is also survived by seven grandchildren: Megan (and husband Tyler Mitchell) and Matthew Baker; Wilfred and Maxwell Albright, and Axel, Ariel and Jamil Handy; and many close relatives and friends. James was predeceased by his wife, Corinne Baker; son Jefferson Pariseau Baker, and sister Joyce Longe. Each human being is significant. Thrust your finger into a vessel of water. The water rises A great deal, in a small vessel Unnoticed, in a vessel the size of Lake Champlain. Withdraw your finger from the water in the vessel, The water decreases To the same extent as the rise. Note the evidence of your finger’s presence after the ripple subside. Would anyone know you were there? Visiting hours will be on Friday, February 27, 2015, from 4 to 7 p.m. at LaVigne Funeral Home, 132 Main Street, Winooski. In lieu of flowers, memorial contributions may be made to Christ the King School, 60 South Main St. Rutland, VT 05701 or Mount Saint Joseph School, 127 Convent Ave., Rutland, VT 05701. A Mass of Christian Burial will be celebrated on Saturday, February 28, 2015, at 11 a.m. at the Holy Family Church in Essex. Condolences may be shared with the family online at lavignefuneralhome.com.